At Pack for a Purpose (PfaP), we are committed to total transparency. We want all PfaP travelers to be able to trust the information on our website and to trust that the supplies they take are being delivered to the projects they were taken for. Because of this, while our favorite activity is addition, we also find ourselves using subtraction to keep our website current and accurate. We will start with addition. Since January of 2018, PfaP has added 74 new participants (tour companies and accommodations), as well as one new country, the kingdom of Bhutan. In total, we currently have 467 participants in 68 countries, offering a wide range of accommodations, tour companies, and countries where you can Pack for a Purpose. Our volunteers have given over 11,400 hours since our inception to maintain and grow our website. They have done this all for cookies, not the kind you find on the web, but the kind that come hot out of our founder’s oven! The generosity of PfaP travelers has multiplied over the last eight years. The increase in the number of tour companies and accommodations is part of the equation as well as an increase in the number of PfaP travelers as awareness spreads across the globe. Pack for a Purpose travelers’ generosity and desire to make a Big Impact is a constant. Subtraction is sadly a necessity. 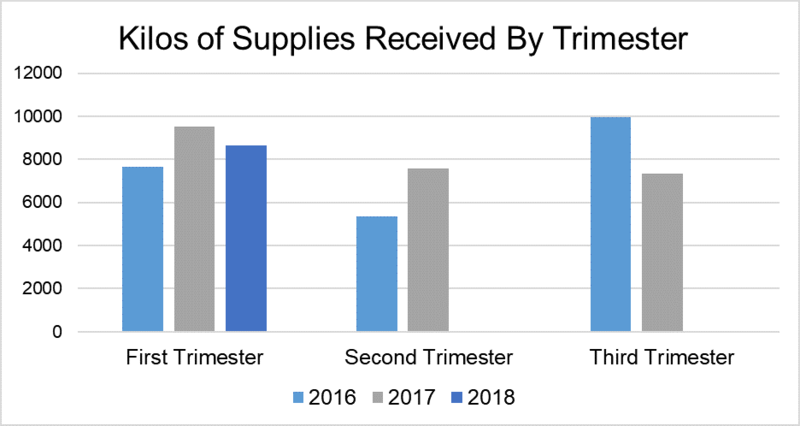 For the first trimester of 2018, our participants received 8,645 kilos of needed supplies. However, this was 10% fewer kilos of supplies than were received for the same time period in 2017. We do not believe the generosity of PfaP travelers has diminished, but rather fewer kilos were taken as many places in the Caribbean were devastated by a series of hurricanes in 2017 and were not up and running the first few months of 2018. We hope and believe in 2019 we will see a greater number of kilos received. On a positive note, the kilos received in 2018, though less than in 2017, were 13% more than those received in 2016 for the same time period. Subtraction also takes place regarding participants. Some participants, which are small businesses, sometimes simply go out of business. Other participants are purchased by new owners or larger corporations and these new entities choose not to participate with us. We have very strict requirements of our participants regarding reporting. If participants do not honor their reporting requirements, then we remove them from our website. PfaP is committed, as an all-volunteer organization located in Raleigh, North Carolina in the USA, to doing everything within our ability to ensure our participants our accountable. In September we will be requesting reports back from all our participants once again, this time for the second trimester of 2018. We hope these reports will indicate an addition over the amount of kilos collected in 2017 for that same time period.